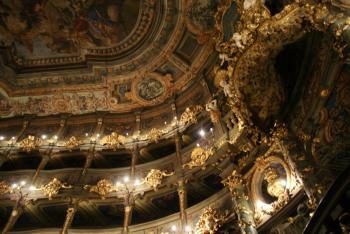 The Margravial Opera House Bayreuth is a 18th century Court Opera House. It is considered a masterwork of baroque theatre architecture. It is the sole surviving example of a Court Opera House in the world (many others have been destroyed by fires), and its layout, design and materials have been preserved mostly unchanged. As it is located in a public urban space instead of within the walls of a private residence, the Margravial Opera House can be seen as a precursor to the later great public opera houses. This Opera House was built between 1745 and 1750. It was commissioned by Margravine Wilhelmine, wife of the Margrave of Brandenburg-Bayreuth. 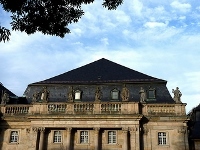 It was one of their many building projects in Bayreuth and an expression of courtly self-representation and absolutism. She surrounded herself with artists, and was a gifted composer and supporter of music herself. The interior was designed by the Italian architect Giuseppe Galli Bibiena. 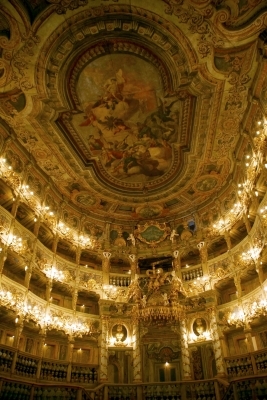 It is a loge theatre with three tiers of loges, made out of wood and painted canvas. It could hold an audience of 500. It is still in use as a theatre. While I was in the general area (Munich is about 2 hours away), I just had to tick off this Opera House. The year 2017, when the renovations are meant to be over, seems so far away: too long to wait. Bayreuth provided a handy short break in my long drive back home from the South of Germany. I left my hotel in Munich early, and arrived at the city center of Bayreuth at 9.30 a.m.. This city has some 70,000 inhabitants, and the center was a nice surprise. The Opera House surely isn't the only monument the nobility has left Bayreuth. It's worth walking around for a couple of hours. The Margravial Opera House is among the smaller of the many chique buildings. Its 18th century facade is original and one of the reasons for its OUV. Unfortunately it lies in the shade early in the morning, so it was difficult to take good pictures or even enjoy the finer details. Inside I paid the 2,5 EUR entrance fee to see the exhibition. The ticket seller asked if I was aware that the theatre hall itself was under renovation - clearly they want to lower the expectations. 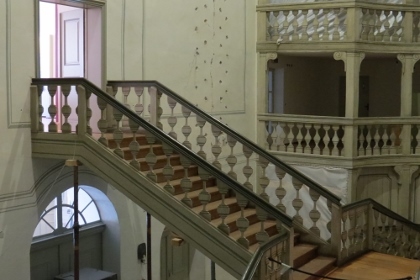 Two exhibition rooms are now available on two floors: the first focuses on the technicalities of the restoration, the second on the buildings history and former use. A caretaker came upstairs with me to show the possibilities of the audiovisual 'table'. This is indeed a good addition, as it shows you how the interior of the theatre looks like from all corners. You can also zoom into the various ornaments. The route between the two exhibition rooms passes the Court Loge and the original stair case. Here you get a hint of what the rest might look like. From this viewpoint you can also peek inside the main area, but there's nothing more to see than scaffolding and coverings. In total I spent about 20 minutes inside - still wondering why on earth the WH nomination and the undoubtedly necessary restoration works weren't better coordinated time-wise. With the restoration works finally complete after a long six years, the Margravial Opera House again shines in all its glory, and it is really a fascinating site to visit. Granted, from the outside, it looks rather inconspicuous - I actually walked right past it the first time. Inside, however, it is exceptionally beautiful, and you can really imagine what it must have been like to watch a performance in the 18th century. As stated below, you buy your ticket and wait for a time slot (I visited in November first thing in the morning and there were only a few people there, but when I left, it was completely crowded), then you can walk around freely. There is a short film, and a lady also went to the stage to give a little talk about the history and renovation. The interior is rather small, so you really have enough time to admire everything. Unfortunately, the stairs are closed, so the boxes are off-limits- but still nicely visible from below. 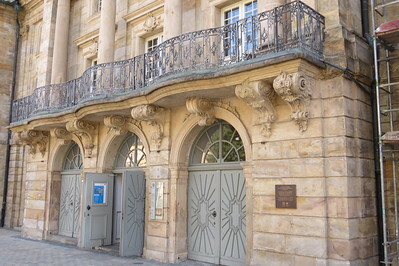 Bayreuth is a pretty town just about an hour from Nuremberg and has many other interesting sights, many of them related to Richard Wagner, who was responsible for Bayreuth's second golden age over a century after Margravine Wilhelmine. 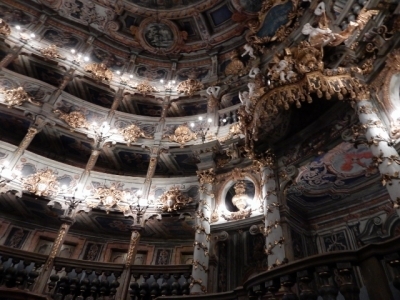 The Margravial Opera House in Bayreuth reopened in April 2018 after six years of restoration. A business trip gave me the opportunity for a detour to visit the Opera House a second time. It was the second day after the reopening, but when I arrived only four other people were waiting for the next time slot. Things have changed a bit, there are no guided tours. Every 45 minutes a short multimedia show starts (a screen is lowered on the stage), then you can visit the interior on your own for the rest of the time slot. But there is no access to the boxes. Taking photos is possible, there is no guide, "we can not prevent it" was the answer to my question on photo permission. I was really delighted, even more than at the first visit. The restorers have done a good job: the interior looks brighter, darker shades of an earlier restoration and oily insect repellents have been removed. The aim was conservation, not a reconstruction, traces of usage are visible, you can see that it is old. But that only increases the charm of the theatre, it's really a little gem. There will also be opera performances again (stage technology, fire protection and air conditioning have also been modernized), but for conservational reasons only a few events in the summer. Would be a reason for a third visit. Bayreuth is a bit off the beaten track, but a visit is worthwhile and the WHS can be properly visited in less than an hour. Currently (August 2013) the situation is similar to remarks already mentioned - the auditorium is closed for reconstruction (although you can see a glipse of how it looks like as the is a courtain with painted view), you can enter the lobby and some coridors with a small exhibition (entrance fee is 2,5 Euro for adults, children under 18 are entering for free) for having some impresions of opera interiors but probably it is better to wait until 2017 for finishing reconstruction works. I visited this WHS in Bayreuth in June 2013. I wasn't expecting to see much since it is closed for restoration works till 2017! The exterior is quite interesting to see but nothing special compared to the baroque interior. There's a "temporary" information centre which allows you to visit the lobby and see a couple of pictures and information. It would have been an interesting initiative had this been FREE ... unfortunately it is not and is nothing short of a tourist trap and a rip-off for what you get. I decided to complain about this and asked to talk to a manager or someone responsible ... and boy was I treated with true German efficiency, respect and hospitality. After listening to my complaints, the person responsible said that my complaints would be duly considered and recorded, and to my surprise instead of showing me the way to the door ... I was invited to have a quick peek inside since there were works going on in the interior and a number of workers were on their way in after their lunch break. 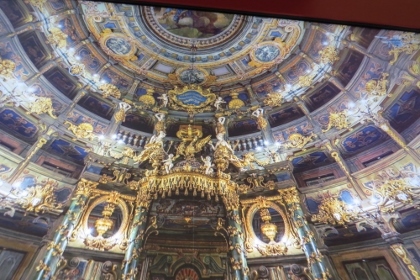 The seats and other furniture was covered with plastic but most of the rich baroque decorations and part of the ceiling were fully visible. It certainly made my day and I promised myself that I'll visit again in 2017 to see it in its full splendour. 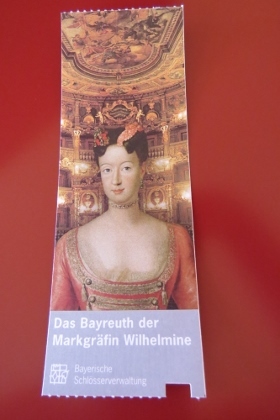 The Bayreuth Opera House will be nominated for incription to the WHL in 2012. The Opera House is considered a unique example of a baroque theatre. It was built between 1744 and 1748 during the governance of Margravine Wilhelmine, an older sister of Frederick the Great from Prussia. When I entered the hall I was overwhelmed by the ornate wooden interior, the steeply rising boxes and the ceiling painting. The interior was smaller than I had expected, but at that time opera performances were only for the Margrave and his guests, not for the public. I visited the Opera House on a weekday in March 2011 and was the only participant in the guided tour. Mostly this can be boring, but not in this case. The guide was highly qualified and he talked not only about the history of the building and the life of Margravine Wilhelmine, but also in detail about the upcoming restoration. On one part of the wall the restoration was tested and one can imagine how bright the interior will be when it is finished. I had also the opportunity to visit the upper boxes, which is not possible with a larger group. The renovation will begin in September 2012 and last for several years. Thus, it could be that the Opera House will be inscribed in the WHL (and I hope they make it), but will be closed for a few years. In any case, I will come back after the renovation and can hopefully attend an opera performance. By the way, do not mistake the Magravial Opera House with the Bayreuth Festival Theatre, where the famous Wagner Festival take place. Update June 2012: Now the Opera House is inscribed, but unfortunately, the upcoming restoration will last until 2017. The Opera House is open for visitors until September 30th, 2012.